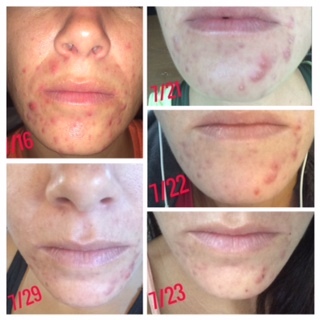 I have struggled for the past 2 years with adult acne. It is mostly around my mouth and chin, and a little on my cheeks. I've made the mistake of picking and touching my face more than I should have which has caused marks on my face. It's been very frustrating. It's time to figure out my acne once and for all. Once I get my active acne under control I plan to talk with a plastic surgeon about removing the acne scars and marks. But, first things first, I need to control my active acne. Over the last couple years, I've tried numerous acne products -- both topical and medication, both over the counter and prescription. (If you want me to list what I've tried in past, then just ask, there have been so many as I'm sure you all have tried too!) Nothing has worked for me. They all only dried out my skin, caused extreme redness, and unfortunately never stopped the breakouts. I have taken a look at my diet and realized that spicy food is causing breakouts. My skin does much better with bland food, so I've completely eliminated chili peppers, red pepper flakes, jalapenos, paprika, cayenne, chili powder, curry. These spices are from the nightshade family and contain capsaicin (one of the chemicals that give them heat). Although they aren't in the same family, I try to keep strong spices like garlic, cumin, and black pepper to a minimum as well. It's interesting, since removing spicy foods from my diet I now get a reaction within a minute of eating something that has capsaicin in it. My face gets hot, like a burning sensation under my skin, and I can literally feel acne forming right away. My acne has improved considerably since eliminating spice but I am still breaking out. So, I'm continuing to test various foods to see what ones my skin reacts to. I'll continue updating this post as I discover new foods. Feel free to comment if you have found a food that causes acne that you think I should be aware of. Step 1. Wash with Epicuren citrus herbal cleanser. The most important part of this is that I am cleansing very gently. I used to scrub my face which, I realize now, was really aggrevating my skin. After reading many posts on this site, I decided to be more gentle when cleansing my face. I work up a good lather of the Epicuren and warm water in my hands first, and then I barely touch my face when washing (wash for about 10-15 seconds). When rinsing, I splash warm water on my face, again barely touching my face with my fingers. I let the cleanser do the work rather than my fingers or a washcloth. I prefer to wash my face in the shower so I can just let the water run on my face eliminating my fingers touching my face completely. Step 2. I use a clean towel to softly blot my face dry. No rubbing or wiping with the towel. I let my face completely air-dry for about 10 minutes. Step 3. Use q-tip to gently spot treat blemishes, active acne, and acne scars with Derma e Tea Tree and Vitamin E Oil. I let my face completely air-dry for about 10 minutes. Step 4. I dot my face with Derma e Tea Tree and Vitamin E Antiseptic Creme to moisturize. Again I gently work the moisturizer into my face by blotting with my fingers. No wiping or smearing the lotion on my face. I let my face completely air-dry for about 10 minutes before applying makeup or going to bed. I do this routine morning and night. I started this skin care routine on 7/16 so it's only been 2 weeks. On 7/15 I ate food with capsaicin so you can see in the picture below that on 7/16 my face was really inflamed. Over the next 2 weeks I was very gentle on my skin, used the routine above, and didn't eat any capsaicin. I'll continue to update this post as time goes on and let you know if my acne continues to improve and clear up. So far, I'm happy with the results but certainly not completely satisfied.